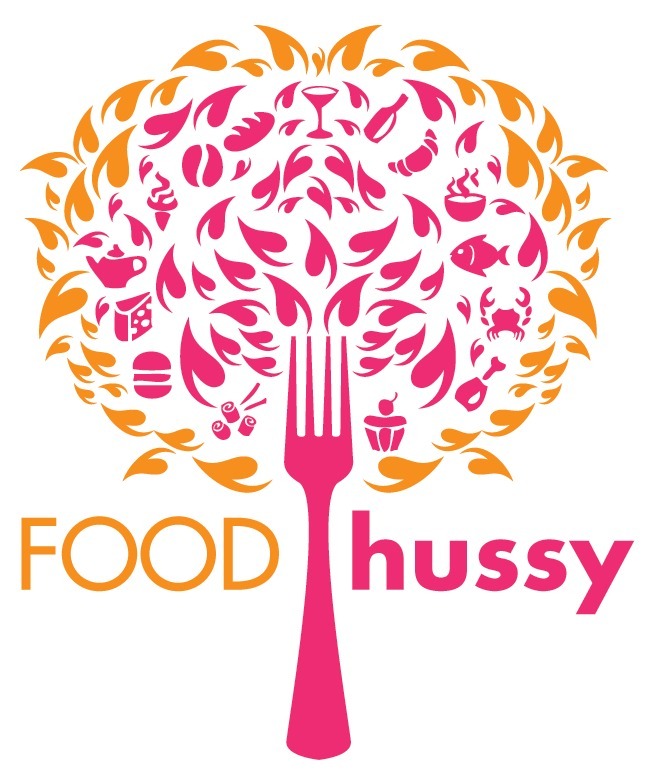 Recipe: "Blackened" Salmon Tacos | The Food Hussy! I went on a cooking spree last week so I have a bank of posts ready to go! 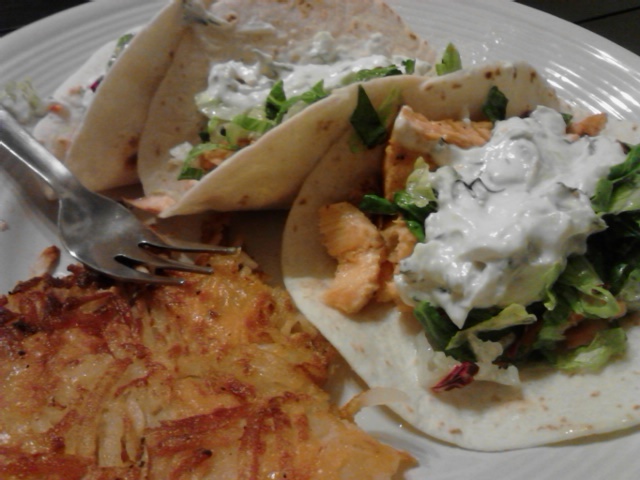 First up for me was Blackened Salmon Tacos out of Woman's Day magazine. We've been having this discussion around the office - and I'm a stringent Meijer shopper. I just cannot get behind Kroger! It seems like every time I go I buy 5 things and it's $30! I get a cartful at Meijer for $100/week and love it. I'm a couponer too though - so that helps. Although I might go back to a Meijer/Aldi combo again. Aldi has a gallon of milk for $1.99!!!!! But back to salmon - I got a pound of salmon at Meijer and while it tasted great - their fish butcher (is that what you call it?) 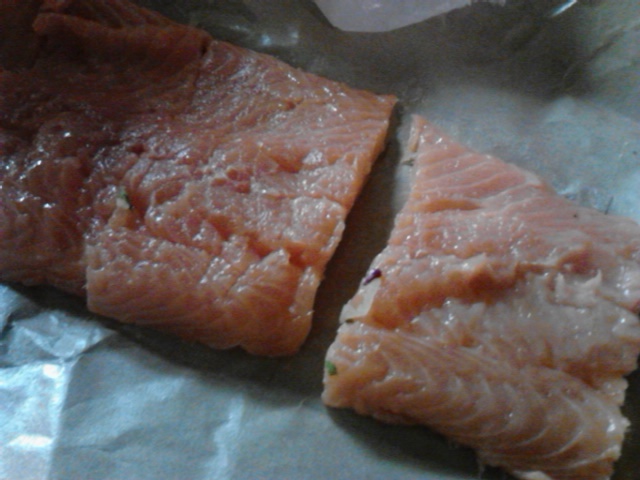 needs to get some skills - this salmon looked pretty beat up. 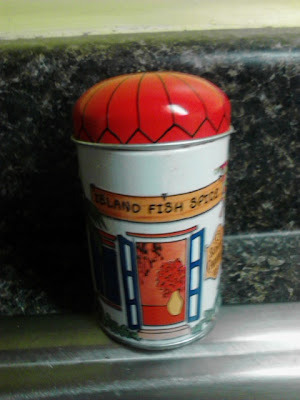 I'm not too much a fan of "blackened" which is used with a specific blackening (mix of paprika, oregano, thyme, cayenne, black pepper, white pepper and garlic powder) or Cajun seasoning - so I used my Island Fish Spice that I got on vacation a couple years ago. I don't use it often but it does taste great! 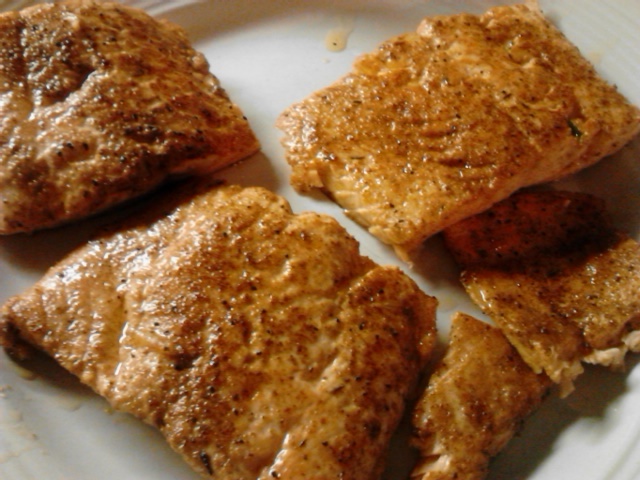 I coated both sides of the salmon with the seasoning and then pan-fried them for a few minutes on each side. They cooked up beautifully! 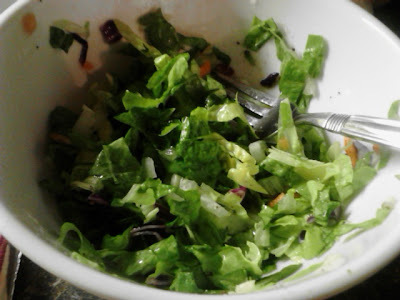 I also mixed together fresh lime juice, olive oil, salt and pepper and then tossed some lettuce into the dressing. Once the salmon is done, I flaked it and put it in the tortillas. After that topped it with the dressed lettuce and leftover Tsatsiki from blublu. I also had some left over hashbrowns from making another batch of breakfast cups. These salmon tacos were delicious! I had never really thought of using salmon since most fish taco recipes use a white fish - but these were really great. The tsatsiki was also a nice add - it took the place of sour cream and added a nice fresh zing! I would highly recommend this recipe and just branching out with tacos in general. These were delicious! And I had extra salmon left for lunches and my husband! Also, I'm a loyal Kroger shopper. I've tried others, just not the same. I can get a cart full every week for around $65 and you would never get a piece of fish that look that bad at Kroger. I don't use many coupons, maybe one a week, but there are more ways to save at Kroger.